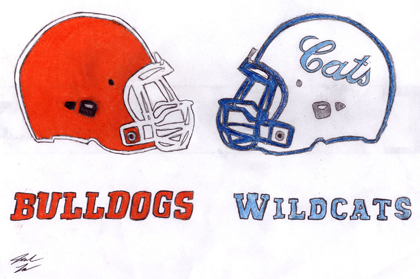 Today’s District 4-AAAAA showdown between Artesia and Lovington is illustrated in this drawing by Artesia High School junior art student Josiah Lara. Kickoff is slated for 7 p.m. at Bulldog Bowl. The Bulldogs’ bout tonight against Lovington at Bulldog Bowl is in no danger of being billed a marquee matchup. The struggling Wildcats are 1-8 on the year to the ‘Dogs’ mirror image 8-1. Their lone victory came back in Week Three against Ruidoso, 38-28, and the ‘Cats were beaten handily by Artesia’s first two District 4-AAAAA conquests, Roswell and Goddard, by respective scores of 41-0 and 42-14. But that doesn’t mean there’s no reason to bundle up and head to the Bowl. What will be on display is a home team that has fought – at times through significant adversity – their way to a stellar record and provided fans with plenty of excitement along the way. When they take the field today, potentially for the final time under the Friday night lights, it will be with the intent of putting a punctuation mark on a season to be proud of before turning their attention to the playoffs. The 2015 season of Artesia football has been a team effort in every sense of the word, and tonight will be another important step toward the ultimate goal. The ‘Dogs have done exactly that, going 4-1 through the gamut Class 6A portion of their annual schedule and putting themselves in position to make a clean sweep of the district today. After topping scrappy Roswell in their D4 opener, Artesia shone in all phases last week against Goddard in a 48-8 win and will be looking for a similar effort against Lovington. “As we move into the playoffs, it’s going to be the teams that finish the strongest and continue to improve that are playing in the state championship as opposed to the ones that are just satisfied to coast along, so our goal is to go out and make ourselves a better team,” Henderson said. The Wildcats return just a handful of athletes from a 2014 squad the Bulldogs defeated 55-19 on the road, with new faces under center and at running back in 6-foot, 150-pound junior Brook Quinones and 6-foot, 180-pound sophomore Isaiah Hinson. The Lovington offense was held completely at bay last week against Roswell but was able to get on the board Oct. 23 versus Goddard on a 15-yard touchdown run by Hinson and rounded out the 42-14 final late in the fourth on a four-yard TD pass from Quinones to Caden Bailey. That shouldn’t be a problem for the brotherhood that is the Bulldogs. “I think anybody who’s watched this group should be excited to have the chance to watch them one more time before we go into the playoffs, and we’re excited about Friday night,” Henderson said.